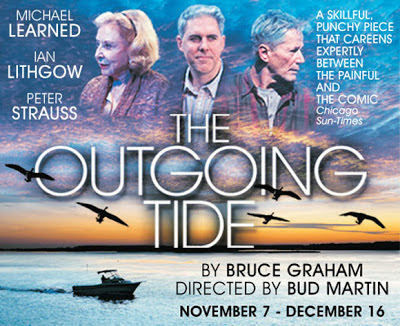 I was fortunate enough to catch Bruce Graham's "The Outgoing Tide" at 59E59 last weekend. This is the play's New York premier. Starring Michael Learned, Peter Strauss and Ian Lithgow, "The Outgoing Tide" a dramedy about a family stuck in a mire of indeciviness about change being forced upon them. Peter Strauss, in a truly brilliant performance, plays rough yet surprisingly tender Gunner who is suffering from dimentia. I was absolutely blown away by his performance. His wife Peg, played beautifully and subtly by Michael Learned, is grasping at her rope's end and is trying to make things easier for both of them while wading in a little bit of denial. Their grown son Jack, played by Ian Lithgow, is dealing with his own issues, both with being a father and coming to terms with his relationship with his own father. I found the play to be very funny while being realistic, even while it tackled the sad and all too prevalent topic of aging parents. At first, I was taken aback by the crassness of Gunner, but I found myself agreeing with him, cheering for him and even crying for him. His character is brave and realistic. I could see my own mother in Peg, in her wanting to take care of her husband, even in her denial of the seriousness of his condition. I was slightly reminded of "On Golden Pond," but without the angst. It's beautiful one set production with lovely lighting. Dirk Durossette was on board for scenic design, while lighting was by James Leitner. The smoothly run show is directed by Bud Martin. The producer is Delaware Theatre Company. Tickets are available online via Ticket Central or by calling 212-279-4200. 59E59 Theaters is at 59 East 59th Street between Madison and Park Avenues. It's running until December 16th and is well worth a viewing.